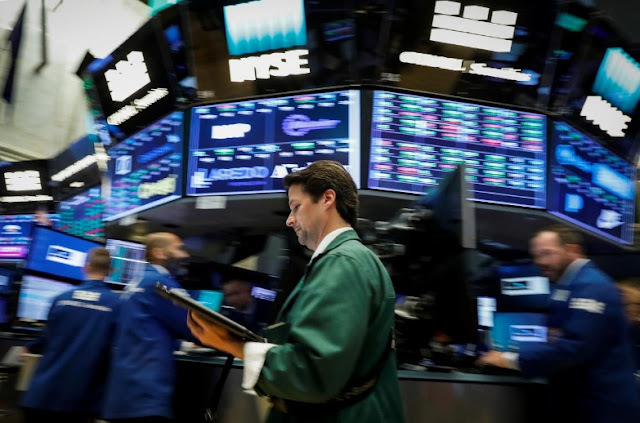 Wall Street opened lower on Friday after a report showed U.S. employment fell in September for the first time in seven years as Hurricanes Harvey and Irma left displaced workers temporarily unemployed and delayed hiring. “In any normal month, this print would have sent tremors across global markets, but September was no normal month,” said Marcus Bullus, trading director at MB Capital. At 9:34 a.m. ET (1334 GMT), the Dow Jones Industrial Average was down 27.86 points, or 0.12 percent, at 22,747.53, the S&P 500 was down 4.6 points, or 0.18 percent, at 2,547.47. The Nasdaq Composite was down 13.79 points, or 0.21 percent, at 6,571.57. The decline could snap this week’s record-setting run for the indexes. The S&P 500 had marked its sixth straight record closing high on Thursday, in large part due to gains in the technology index .SPLRCT. However, on Friday the sector fell 0.3 percent and dragged down the broader index. Financials .SPSY - which rose 0.2 percent - was the only gainer among the 11 S&P sectors. Costco dropped 5.1 percent to $158.50 after the warehouse club retailer reported a fall in gross margins due to an intense price war among grocers. The stock weighed the most on the S&P 500 index. Synchronoss Technologies jumped nearly 28 percent to $13.66 after the software maker said it would restart buyout talks with top shareholder Siris Capital Partners. Drug store chain Walgreens Boots Alliance was down nearly 2 percent following a Morgan Stanley downgrade and price target cut. Declining issues outnumbered advancers on the NYSE by 1,849 to 661. On the Nasdaq, 1,411 issues fell and 842 advanced.